I got stuck, so I tried translating. The book with music notes on it says “children’s song” and contains lyrics to a children’s song about a caged bird, a stork, and a turtle. The book with the key on it says “method of escape.” Duh. The bird book was tough. I think it says something like, “I will move to a place where I can always see people I love,” and then on the page with the bird footprints, I think it just describes the bird’s feet: one short toe behind three toes. Got through with the normal end and it plays the song from the book, with kids and the bird playing the game that goes with the song. Cute. I’ll come back later to try to get the other end and write a walkthrough. Okay, here’s the walkthrough. The first run is mostly recon. There’s a table with nothing you can use, a door that needs a shape code, and a door that’s missing a handle. There’s a locked birdcage. We’ll probably need a key. There’s a locked door next to three levers. We need a height clue. Above these is a cupboard with four members of a marching band. In the center is a button, but it looks like we need something to hold it down. There’s a picture on the wall. If you click it, it moves, so we probably need a corners clue. There’s a mobile with a key hanging from it. Can’t take it yet; probably need scissors to cut it off. The standard locked door is also on this wall. Here’s the mother-lode. 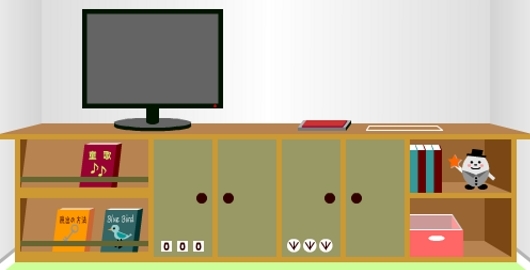 There are two locked cabinets (a number code and a direction code), a TV (those always require a remote), and assorted other things. Click on the books on the left. The “blue bird” book has a clue on the first page. I’ll call it the BIRD BOOK CLUE. (Oddly, although the spines are on the right, Japanese-style, you click on the right page to flip through the book.) Next to the TV is a red rectangle that doesn’t seem to be a button and a white square that will probably be useful later. On the right side of the shelf you can get SCISSORS from the box and a STAR HANDLE from the Humpty Dumpty figure. The star handle fits in the door on wall 1, giving you the REMOTE. Amazingly, it already has batteries. When you use it on the TV, you get a FLOWER CLUE. Look closely: some of the leaves are darker. There are also five on each stem. This could be the HEIGHT CLUE for the levers on wall 2. The levers have five heights. Counting from the top, you want them at 412. Still confused? Here’s how many times to click each one: 134. Using the code on the levers opens the door next to it, where you find a TURTLE. On the bottom is the TURTLE CLUE. The scissors get you the STAR KEY from the mobile on wall 3. (Cut it off, then pick it up off the floor. Apparently, you don’t know how to use both hands. Or maybe you only have one. That’s cool.) Will it open the door to the room? Of course not; your inventory isn’t full yet. There’s only one other place to try it: the birdcage. The grateful bird gives you a PINK NOTE. Open it and notice the pattern looks like numbers on a digital display. Hey, what did that clue say? Take the clue from the bird, and subtract the blue lines for the first number, the yellow lines for the second number, and the red lines for the third number. Cover them up if it helps. Put the code in the number cabinet (wall 4) and get a BAND LEADER. He matches the figurines in the box on the opposite wall, so let’s try putting him there. He holds down the button in the center box, so you can click the musical note button. His baton gives you a CORNERS CLUE. Use this clue to remove the picture on wall 3. Now there’s a card slot. Don’t forget to check the fallen picture: on the back is a CARD WITH HOLES. It’s not obvious where to go next, so look around the room. Somehow, there’s now a bird on each wall. (Actually, they’re the same bird; it’s just really fast.) The one on wall 4 is on the red thing (an ink pad) and has left a mess of footprints. Put the card in the white square to get the DIRECTION CLUE. You have footprints labeled 1, 2, and 3 and an arrow telling you to enter them from left to right. If you flipped all the way through the bird book, you may have noticed that the symbols on the second cabinet were bird footprints, not arrows. Enter the code to get a STORK. Examine it to find a STORK CLUE on the bottom. This tells you that wall 2 is north, and there’s a bird. Look again at the turtle clue: SEN could refer to three of the walls. Now we know which ones those are. The only thing unsolved is the shape code, so maybe this is a clue for that. The stork and turtle clues combined give you a sequence of three walls, and the stork clue mentions a bird. Since there’s one on each wall, look at where each one is and see if you can associate it with a shape. South (wall 4) has a bird on a rectangular ink pad. East (wall 3) has a bird on the mobile with the pentagons. North (wall 2) has a bird in the cage. West, which we don’t need, has a bird eating round hotcakes. The code is: rectangle, pentagon, solid birdcage shape (or like an arched doorway). Put in the shape code to get a CARD. Put it in the slot by the door to get the EXIT KEY. You can now escape for the normal end. Take the bird eating hotcakes. For some reason, it’s the only one you can pick up. Unlock the door and exit. The happy end has the same song but a different animation. Posted on Tuesday, September 17th, 2013. Follow any responses through the RSS 2.0 feed.